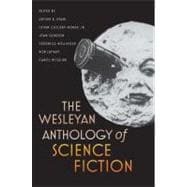 The Wesleyan Anthology of Science Fiction features over a 150 years' worth of the best science fiction ever collected in a single volume. The fifty-two stories and critical introductions are organized chronologically as well as thematically for classroom use. Filled with luminous ideas, otherworldly adventures, and startling futuristic speculations, these stories will appeal to all readers as they chart the emergence and evolution of science fiction as a modern literary genre. They also provide a fascinating look at how our Western technoculture has imaginatively expressed its hopes and fears from the Industrial Revolution of the nineteenth century to the digital age of today. A free online teacher's guide accompanies the anthology and offers access to a host of pedagogical aids for using this book in an academic setting. The stories in this anthology have been selected and introduced by the editors of Science Fiction Studies, the world's most respected journal for the critical study of science fiction. ARTHUR B. EVANS is a professor of French at DePauw University. He has published numerous books and articles on Jules Verne and is the general editor of Wesleyan University Press's Early Classics of Science Fiction book series. ISTVAN CSICSERY-RONAY JR. is a professor of English at DePauw University and the author of The Seven Beauties of Science Fiction (Wesleyan, 2008). JOAN GORDON is a professor of English at Nassau Community College and coeditor of several volumes of scholarly essays on science fiction. VERONICA HOLLINGER is a professor of cultural studies at Trent University in Peterborough, Ontario and the coeditor of Queer Universes: Sexualities in Science Fiction (2008). ROB LATHAM is an associate professor of English at the University of California, Riverside, and author of Consuming Youth: Vampires, Cyborgs, and the Culture of Consumption (2002). CAROL MCGUIRK is a professor of English at Florida Atlantic University and is widely published in eighteenth-century studies and Romanticism.